Reference number for this case: 14-oct-54-Biot. Thank you for including this reference number in any correspondence with me regarding this case. Almost at the same time, a similar machine (the same one undoubtedly) was seen above Grasse, Saint Raphael, Opio, Gourdon, Bar-sur-Loup and Roquebrune-Cape-Martin. Now the "saucers" make their appearance in our sky, if one believes the very large number of testimonies - sometimes contradictory - about them that one can read below. We will restrict ourselves to record them, we will not conclude in the "hot" debate which oppose the "pro-saucers" and the "anti-saucers." Yesterday morning, in Biot on the place of the arcades, all the village spoke only saucers and appearances and, already, the two clans, now inevitable in such a case, were formed. Indeed, in the current of the afternoon, our correspondent in Antibes had discovered, thanks to the complicity of his chief of service, Mr. Courbey, tax collector of Antibes, the eyewitness of this adventure who disturbed since Thursday evening the quietness of the village of Biot and its inhabitants. Because, if in Biot the witnesses are numerous, who have seen a craft evolving in the air, at 06:15 P.M., only one had the chance to see it at the time of the "takeoff" whereas he was returning from work. José Cassella is a 19 year old boy, native of Biot and remaining there with his parents, in street of the poissonerie, his father working with the Water-company of the city. Every day, morning and evening, he goes down the road from Antibes to Biot to go to his workplace, at the Town Receipt, boulevard of Aguillon in Antibes. The event did not disturb the accounting department and when we entered in the buildings of the receipt yesterday afternoon, everyone was busy with his daily work. As for as of José Cassella, when we indicated the purpose of our visit, he did not even raise the head. However, after having refused to utter his name, refused even the least indication, of fear of "ridiculizing rumours" on behalf of his fellow-citizens, we led him to some confidences, then to a complete description of the craft, or, at least, of what it had had the time to see. "So it was thus 06:15 P.M. I drove towards the village and I was going to take the turn of the road of Biot, at the chemin Neuf ["New driveway"], skirting the wall enclosing the old property of the sculptor Bourayne. Suddenly, I was face to face with an oval shaped mass, of aluminium color... and instinctively, as I would have done in front of any other object or vehicle barring me the road, I slowed down." "A this precise moment, without a noise, but with an indefinable speed, the saucer - for I had to admit it, what I had just seen is one of those - the saucer rose vertically, then disappeared in the sky." "I was then within six meters and I perfectly distinguished the circular shape of the object, of which the higher part was slightly reinflated, while the lower part resting on the ground was the shape of a half-sphere. I din not see anything else, no asperity, no porthole, the object was completely smooth and shone under the last luminous rays." "Based on the width of the road, the machine may have had 5 to 6 meters in diameter and a little more than a one meter height." "After its departure, no trace could be found on the road and when I returned from the village a little later nothing could let anyone find out that a flying saucer had landed there." The "flying saucers", the "crypto-saucers", their substitutes, assimilated, etc., become day by day more familiar to the inhabitants of the Alpes-Maritimes. Each commune wants its own. We are still far from the 165! ... But we will probably get there soon. There is no reason for jealousy. If Prévert repeated his famous prayer "Our Father who are in heaven, stay there, etc." we would not fail to add now "give us our daily flying saucer..."
Enough with the jokes! Let's talk about serious things. Here is the menu of the last days (because there are saucers to content). But, says the reader with a scientific mind, what are these three disks doing in the saucers? Bah! You will see many more... In doubt, we note everything. One does not risk thus to let miss a "truly true" saucer. Let's change the disc. We lost the ball in Monaco. Here are some details: the colors were bright, like a fireworks' flare... The sphere was heading horizontally towards Italy. We only saw it for a few seconds. Finally, one of the witnesses said: "Before I saw this luminous ball, I have always been a great skeptic" (so great, really?). REVEST. It is a hunter who saw a luminous machine of about one meter at Revest." Having seen it fall at 60 meters from where he was, he ran to the probable point of fall but could not find any trace. So, the flying saucers, we repeat to the serious (?) reader: "It's old-fashioned now, we do not say saucer anymore, we come back to the summary and pictorial description, have patience!" Finally, outside the Alpes-Maritimes, things are done better. Between Toulon and Hyères, two Toulon motorcyclists met on Thursday at 6:45 p.m. a flying saucer (At last! our reader says). meadow near the place known as "Chemin Long". Stunned, the two motorcyclists, Mr. Repellini, restaurant owner, and Mr. Ottaviani, a merchant navy engineer, approached the machine, which had the shape of a disk swelled on top with two crutches put on the ground. It was equipped with two ear-shaped fins on the sides. One man (the two motorcyclists had the impression that there was another man inside the craft), measuring 1.60 meters, dressed in a gray-white suit made of strange cloth, probably made of asbestos or glass-wool, looked at the two residents of Toulon. - No I am French. - In Provence. Do you want to go to the base of the Palivette? "You are here between Toulon and Hyeres." At these words the mysterious individual nodded his head and walked into the apparatus through the triangular-shaped porthole. At once the machine, which had not ceased to vibrate, began to vibrate louder. The two Toulonians clearly perceived a sound of steam as before the stop of a locomotive and the apparatus rose from the ground slowly, heavily, vertically, as if it was sucked up. This resembled the flight of a woodcock. Having reached 50 meters in altitude, the disc stopped for a moment, then resumed its flight at full speed towards Hyères while letting orange gleams escape and making a noise like that of the jet of a percolator. Mr. Ottaviani had time, during the discussion between the mysterious individual and Mr. Repellini, to make a sketch in profile and elevation of the apparatus. These sketches were shown yesterday to the journalists in front of whom he maintained his statements, as well as he did in front of the naval security and police services. Since the statement of the young José C... who says he saw a flying saucer in Biot, the people who saw the mysterious machine are more and more numerous. In Antibes, Thursday evening, around 6:30 p.m., the luminous apparatus has been seen from several parts of the city, for example on the side of the Remparts and the National Road. In the surroundings, some people saw "something"; in Juan-les-Pins, on the other hand, we received only two testimonies. If everyone is unanimous about the hour of the apparition, it must be pointed out that opinions differ about the shape of the thing: flying saucer, cigar, luminous trail, comet. On the other hand, the opinion is the same on the very high speed of the phenomenon. Of course, everywhere, one talks about the famous flying saucer. Conversations are going on at both the Café de la Poste and the Chasseurs restaurant, on the Place des Arcades, opposite the church and everywhere. There, too, several people saw, Thursday evening, something luminous that crossed the sky very quickly. But one is very skeptical about the landing of the craft on the ground of Biot, especially at the place indicated by the young C..., location on a not-so-wide road between two walls and moreover, just after the hairpin bend. Two people went by there at 6:30 p.m. that famous evening, and saw nothing, the flying saucer must like the difficulty, since even a helicopter "pou du ciel" would have had great difficulty to land, the ground being overhung by numerous power and telephone wires. "It was 18 h 15. I rode towards the village and was going to take the turn of the road of Biot to the Chemin Neuf skirting the wall of the old property of the sculptor Bourayne. Suddenly, I was face to face with a mass, of oval form, aluminum color... and instinctively, as I would have done in front of any other object or vehicle barring the road to me, I slowed down. At this precise moment, without a noise but with an indefinable speed, the saucer - as it was necessary to amit it was a saucer, I had just seen one, I who did not believe in it! - the saucer rose vertically then disappeared in the sky." "I was then within 6 meters and I perfectly distinguished the circular form from the object whose upper surface was slightly inflated whereas the lower part resting on the ground was hemispherical; I saw nothing else, no screw, no asperity, no port-hole, the object was completely smooth and shining under the last luminous rays." "According to the width of the road, the machine could have been five to six meters in diameter and a little more than one meter in height. After its departure, no trace could be found on the road and when I returned to the village, a little later, nothing could let suppose that a flying saucer had landed there. And yet I saw it, I was not the victim of an hallucination... no more the victim od any mirage!" Jimmy Guieu indicates that it was indirectly confirmed by a crowd of people who saw the craft firrow the skies little after its takeoff, in Grasse, Saint-Raphael, Opio, Séranon, Gourdon, Bar-sur-Loup, and Roquebrune-Cape-Martin. "Suddenly I was face to face with a mass of oval shape, aluminium color ... and instinctively as I would have done in front of any other object across the road, I slowed down. At this very moment, without a noise, but with an indefinable speed, the saucer - because it had to be ackowledged, I had just seen one, me, who did not believe in that! - the saucer rose vertically, then disappeared in the sky." Michel Carrouges specifies that Cassella had stopped within six meters of the saucer, which measured 5 to 6 meters in diameter and a little more than 1 meter in height. Its circular shape, hemispherical below, was reinflated above. It was completely smooth and shining under the last rays of the sun and did not have any port-hole. Jacques Vallée says that on October 14, 1954, at 6:15 p.m., Jose Casella, working at Antibes, was riding his bicycle through the town of Biot, in the Maritime Alps, when he suddenly found in front of him on the road a massive oval aluminum-like object shaped like an egg, perfectly smooth and bright, 5 to 6 meters long and a little more than 1 meter high. Casella braked, ans simultaneously the object took off in silence at a very great speed. No traces were found. Several residents of Biot confirmed the reality of Casella's experience. Jacques Vallée says that descriptions of what he saw are in the newspapers France-soir, Paris-Presse, La Croix, for October 17, 1954. Oct. 14, 1954, 06:15 P.M., Biot (France). A municipal employee, Jose Casella, was riding home when he suddenly found in front of him on the road an oval-shaped aluminum object about 5.5 m in diameter, 1 m high. As he applied the brakes, the object took off at very high speed. Several persons confirmed the sighting. The disk was gray, supported a dome, and emitted a soft whistle. It took off when Casella was only 6 m away. (Paris-Presse, France-Soir, 17 oct. 1954; 65). 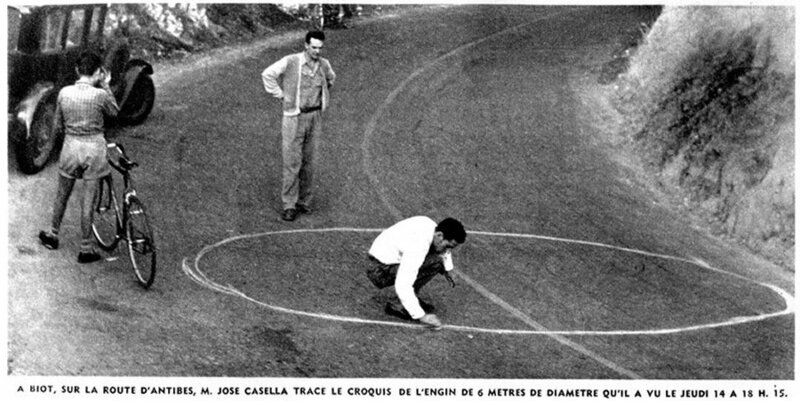 The author indicates that on October 14, 1954, José Casella, city worker, was returning to Biot when he was suddenly face to face, on the road, with an object of oval aluminium shape of approximately 5 to 6 meters diameter on 1 meter in height. He slowed down, the object flew away at a fantastic pace. Several people confirmed this vision. Garreau and Lavier note that on October 14, 1954, at 06:15 P.M., according to newspaper cuttings and their personal files, José Casella, aged 19, employee with the Water Company in Antibes, regained his residence when coming out of a turn he saw an object blocking the road. It was an object of aluminium of oval shape, approximately 6 meters in diameter and one meter in height. The object took off immediately and dazed away at a very high speed. Many witnesses, from Grasse to Cap-Martin, saw it after takeoff. "Biot - 06 - 06:15 p.m.: investigation. Very fast luminous gleam. The landing is a mystification by the Press." "I drove towards the village and was going to take the turn of the road of Biot at the Chemin Neuf skirting the wall of the old property of sculptor Bourayne. Suddenly, I was face to face with a mass of oval form, aluminum color... and instinctively, as I would have done in front of any other object or vehicle barring the road to me, I slowed down. At this precise moment, without noise but at an indefinable speed, the saucer - for it was indeed necessary to admit it, I had just seen one, I who did not believe in it! - the saucer rose vertically, then disappeared in the sky." "I was then within 6 meters and I perfectly distinguished the circular form of the object, whose upper surface was slightly reinflated, while the lower part, resting on the ground, was hemispherical; I saw nothing else, no life, no asperity, no port-hole, the object being completely smooth and shining under the last luminous rays." "According to the width of the road, the apparatus might have had five or six meters in diameter and a little more than one meter in height. After its departure, no trace could be found on the road, and when I returned from the village, a little later nothing could let suppose that a flying saucer had landed there. And yet I saw it, I was not the victim of an hallucination... it was not some unspecified mirage either!" The authors say that Mr. Casella however made a very different report to them: there was no object of aluminum color, no landing, but maybe the spectacular passing of a large meteor which whistled while flying above the region. The witness told the authors that it was the local Press who invented the story, and even made a reconstitution to give more weight to the case. The authors say that as the witness said the object came down, the Press assumed that it had landed, and that when the witness says the object went up, the Press assumes that it took off. The two authors indicate that in Biot, on October 14, 1945 at 06:15 p.m., José Casella, municipal employee, drove towards Biot and was going to take the turn of Chemin-Neuf when he suddenly found his road barred by a mass of oval form, aluminum color, 5 to 6 meters in diameter and a little more than 1 meter in height. The higher part is slightly reinflated, the lower part resting on the ground is hemispherical, the object is completely smooth and shining under the last rays of the sun and is at 6 meters of the witness who slows down. At this precise moment, the object takes off vertically without noise but at an indefinable speed and disappears in the sky. The authors note that according to Vallée the object took off while emitting a soft whistling sound. The authors add that "numerous people" in Saint-Raphael, Seranon, Gourdon, Bar-sur-Loup, and Roquebrune-Cap-Martin, "saw the craft furrow the skies" little after the observation by Mr. Casella. The authors indicate that the sources are case 253 of the Vallée catalogue; C. Garreau and R. Lavier in "Face aux ET" page 123; Jimmy Guieu in " Black-Out sur les S.V" page 219; Quincy; Paris-Presse and France-soir for October 17, 1954. Jean Sider indicates that the counter-investigation by Barthel and Brucker on the CE2 case in Biot in the Alpes Maritimes is "imaginary." He indicates that on October 14, 1954 José Casella saw on the road of Antibes in Biot a saucer posed in the broad middle of the road. He declares that Barthel and Brucker claim on pages 109 and 110 that during their discussion with the witness the latter denied to have described an object landed on the road and that it was perhaps the spectacular passage of a large meteorite [meteor], and that it was the local press that organized a false reconstitution to give more weight to the affair. 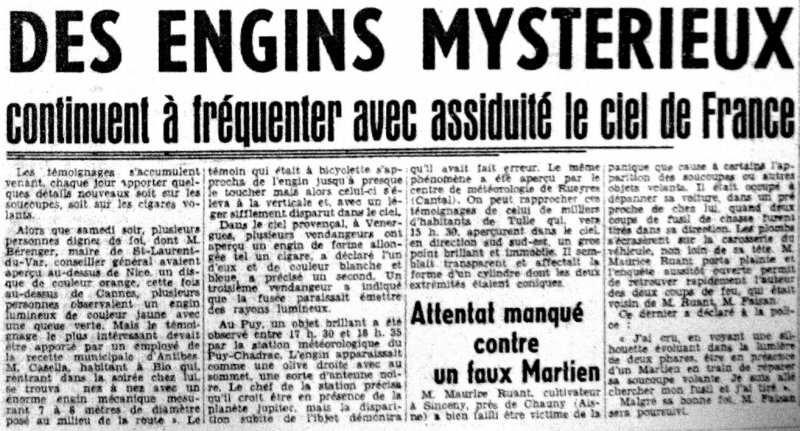 Jean Sider thinks that Barthel and Brucker did not speak to the witness, because Nice-Matin for October 16, 1954 indicates that the newspaper knew about the observation by the initiave of Mr. Courbey, principal receiver with the Municipal Receipt of Antibes and boss of Mr. Casella to whom the latter had told his adventure. The witness had not dared to inform the gendarmerie, perhaps by shyness or avoid "displeasant rumours". The witness had reluctantly testified when the reporters of this newspaper came at his workplace. He made for them a sketch on the wall, and a photograph showing him explaining his drawing in Nice-Matin proves that he did claim to have seen the object posed on the road. There is also a second photograph showing Mr. Casella, on the place of the observation, published in "an important national weekly magazine established in Paris" [Paris Match]. Jean Sider adds that "moreover several people confirmed the testimony of Mr. Casella". Jean Sider insists on the many other observations this same evening in the area and declares that Barthel and Brucker disguised the reality of the facts, that it are desired to standardize this observation to reduce all the others by writing that description that Casella gave them is in agreement with the others. Godelieve van Overmeire indicates that in 1954, on October 14, in France, in Biot, at 18:15 "José Casella returned at his place by bicycle when he suddenly saw on the road in front of him an oval object, 5,50 m in diameter approximately and a height of 1 m. The disc was gray overcome by a dome and it emitted a soft whistling sound. When Casella was no more than 6 m the object took off. Observation confirmed by other people." The source is noted "Jacques Vallée: 'Chronique des apparitions ET' - DENOEL 1972 - J'AI LU COLL. - p. 280". She indicates another version: "a city employee, José Casella, returned home by bicycle, when suddenly in front of him, on the road, there was an object made of aluminium of oval form, having approximately a diameter of 5,5 m and a height of 1 m. Whereas he slowed down, the object took off at very high speed. Several people confirm the observation. The gray disc was surmounted by a dome and it emitted a gentle whistling sound. It took off whereas Casella was only within 6 meters". The sources are noted "Paris-Presse, France-Soir, 17 Oct 1954". 18:15 In Biot (France), José Casella (city employee) returns home by bicycle, when it suddenly finds himself face to face, on the road, with 1 gray object, of aluminum aspect, oval shape, a diameter of 5,5 m approximately and a height of 1 m, overcome of a dome and it emitted a gentle whistling sound. While he slows down and that Casella is only at 6 m of it, the object takes off at very high speed. Several people confirm the observation. Jérome Beau indicates as sources "Paris-Presse, France-Soir, October 17, 1954.". 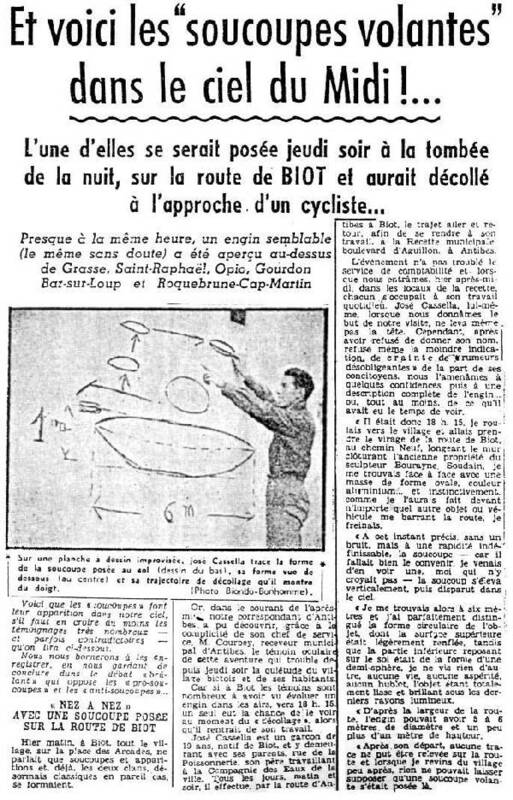 Luc Chastan indicates in his database that in the Alpes Maritime in Biot on October 14, 1954 at 18:15 hours "the witness returned home by bicycle when he suddenly saw on the road in front of him an oval object, 5,50 m in diameter approximately and a height of 1 m. The gray disc was topped by a dome and it emitted a gentle whistling sound. When the witness was not any more than 6 m the object took off. Observation confirmed by other people." The sources are noted: "Mini catalogue chronologique des observations OVNI by Van Overmeire Godelieve ** http://users.skynet.be/sky84985/" and "Chroniques des apparitions E.T. byVallée Jacques ** DENOEL 1972 - J'AI L coll.". The website indicates that on 14 October 1954 at 18:15 in Biot, France, "An oval-shaped aluminum object about 5.5 meters in diameter". "A municipal employee, Jose Casella, was riding home when he suddenly found in front of him on the road an oval-shaped aluminum object about 5.5 meters in diameter, one meter high. As he applied the brakes, the object took off at very high speed. Several persons confirmed the sighting. The disk was gray, supported a dome, and emitted a soft whistle. It took off when Casella was only six meters away." The website indicates that "An object was sighted that had an appearance and performance beyond the capability of known earthly aircraft. One saucer, about 40 feet across, was observed by one male 19-year-old witness on a road (Jose Casella)." The website indicates that the sources are Guieu, Jimmy, Flying Saucers Come from Another World, Citadel, New York, 1956; Bowen, Charles, The Humanoids: FSR Special Edition No. 1, FSR, London, 1966; Vallee, Jacques, Computerized Catalog (N = 3073); Vallee, Jacques, Challenge to Science: The UFO Enigma, Henry Regnery, Chicago, 1966; Vallee, Jacques, Preliminary Catalog (N = 500), (in JVallee01); Vallee, Jacques, Anatomy of a Phenomenon, Henry Regnery, Chicago, 1965; Vallee, Jacques, A Century of Landings (N = 923), (in JVallee04), Chicago, 1969; Schoenherr, Luis, Computerized Catalog (N = 3173). Donald Johnson indicates that on October 14, 1954, at 6:15 p.m. a municipal employee, Jose Casella, was riding home in Biot, Alpes-Maritimes, France when he suddenly found an oval-shaped aluminum object about 5.5 meters in diameter in front of him on the road, one meter high. As he applied the brakes, the object took off at a very high speed. Several persons confirmed the sighting. The object was described as a gray domed disc that emitted a soft whistling noise. When it took off the witness was only six meters away. The sources are indicated as Jacques Vallee, Passport to Magonia: A Century of Landings, case # 253, citing Paris Presse, October 21, 1954; Michel Figuet and Jean-Louis Ruchon, OVNI: Le premier dossier complet des rencontres rapprochees en France, pp. 160-161, citing Jimmy Guieu, Black-out sur les Soucoupes Volantes, p. 219. *Oct. 14, 1954 - At 6:15 p.m. a municipal employee, Jose Casella, was riding home in Biot, Alpes-Maritimes department, France when he suddenly found in front of him on the road an oval-shaped aluminum object about 5.5 m in diameter, 1 m high. As he applied the brakes, the object took off at very high speed. Sev- eral persons confirmed the sighting. The disk was gray, supported a dome, and emitted a soft whistle. It took off when Casella was only six meters away. (Sources: Paris Presse, October 21, 1954; Jacques Vallee, Passport to Magonia: A Century of Landings, case # 253; Michel Figuet & Jean-Louis Ruchon, OVNI: Le premier dossier complet des rencontres rapprochees en France, pp. 160-161, citing Jimmy Guieu, Black-out sur les Soucoupes Volantes, p. 219). The summary by Jacques Vallée is afflicted with inaccuracies: a dome is added, the shape becomes simply oval, and a ambiguity can mislead the reader into thinking that several people saw the takeoff itself, and not simply the object in flight. It is almost obvious that Jacques Vallée discovered the case in the national press he refers to, and that this national press made these inaccuracies. It seems almost obvious to me that the article of Nice Matin, comprising an interview of José Cassella, is more in conformity with his testimony. Jean Sider muddles the case. The "many other observations" are incontestably that of the meteor of 06:15 p.m., without any "landing" obviously. The Cassella report in the press, taken at face value, cannot be a meteor, of course. Barthel and Brucker say that Cassella described a meteor to them and that the press had invented the landing. To claim that the many other observation refute that Barthel and Brucker spoke to this witness, or that all that was not a meteor, does not make sens; in fact Jean Sider implicitely tries to deny that the other observations are that of a meteor. One question is whether Cassella had or had not spoken of a landing on the road at the time. He absolutely did, Jean Sider is right on this matter whereas Barthel and Brucker, although they did exactly not deny this, were wrong to make believe that only the press is responsible: the participation of Cassella in the "landing" version is indeed undeniable. It would have been consequently very useful to to really check whether Barthel and Brucker had or had not heard Cassella say it was only an object only in the sky, instead of just claiming he did not. With no further information, only two possibilities remain. Either Cassella had seen the meteor and had invented the landing for some reason, or, by a rather extraordinary coincidence, a rather doubtful coincidence in my opinion, dozens people saw a meteor passing (this is undeniable) at the very hour when Cassella saw a saucer posed on a road in the same area. With the lack of certainty, I see a scenario reconciling the odd aspects of this case in which at the hour when dozens people independently sees a meteor passing from South to the East of France and beyond, that they call saucer or disc or apparatus but indeed describe like a meteor, luminous, fast, with its trail, a single witness among them claims to see a saucer taking off from the middle of a road. It may be that Mr. Cassella also saw the meteor passing in the sky, but no takeoff. It may be that returned home he heard people talk about the passage in the sky of the "apparatus" which was in fact a meteor, and that he then seized the opportunity to invent that he saw it take off. Since people saw it in the sky, he could have thought that it would give credit to his more "spectacular" version, and that indeed was the case: it was believed, in the Press of the time and by certain ufologists still, that the other "numerous testimonys" "confirm" his. This is wrong twice since on the one hand absolutely nobody confirmed a takeoff, and that on the other hand these other testimonys are not really observations of a flying saucer or UFO, but of a meteor! We are told that Mr. Cassella was shy, and this can explain that he seeked attention by unusual ways. Once his story came to the ears of journalists, he might have been forced to maintain his invention. Decades later, if he was indeed interviewed by Barthel and Brucker, it may be that he did not know that the latter had read the press of the time and the take-off story, so old, and that on this occasion he only told them what he had really seen, omitting the invention he claimed so long ago. It could be argued that I am the one who makes up things here. But let's be serious: the fact is that people invent sometimes landings or takeoffs of saucers which do not have any reality. This happend, few ufologists would deny this and claim that any story is always true. Tgus, we should be certain that this takeoff is not invented. Are we certain it happened? No: there is no evidence, neither physics nor testimonial, of the reality of the takeoff told by Mr. Cassella. There are only reasons to doubt. This is why I think that Mr. Cassella perhaps saw, like so many people, the 06:15 p.m. meteor that day in this area, and perhaps invented the takeoff episode. 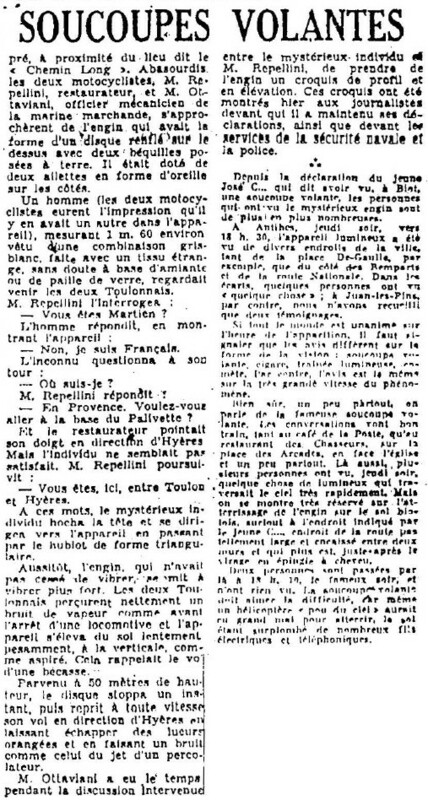 [nm1] Article in the regional newspaper Nice Matin, Nice, France, page 1, October 16, 1954. [---] Article in the newspaper France-Soir, aka Paris Presse-l'Intransigeant, by Jacques Bergier, Paris, France, October 17, 1954. [pm1] "Raymond Cartier répond aux 5 questions que vous vous posez sur les soucoupes volantes", article by Raymond Cartier on the flying saucer phenomenon, in the magazine Paris Match, #291, Paris, France, October 23, 1954. [jg1] "Black-Out sur les Soucoupes Volantes", book by Jimmy Guieu, Fleuve Noir publisher, France, page 219, 1956. [mc1] "Les Apparitions de Martiens", book by Michel Carrouges, (aka Louis Couturier), Fayard publisher, France, page 80, pp 90-91, 1963. [jv3] "Anatomy of a Phenomenon", book by Jacques Vallee, Henry Regnery publisher, USA, 1965. [jv3] "Anatomy of a Phenomenon", book by Jacques Vallee, Neville Spearman publishers, U-K., 1966. [jg1] "Black-Out sur les Soucoupes Volantes", book by Jimmy Guieu, Omnium Littéraire publisher, France, page 219, 1969. [jv2] "The Humanoids: A Survey of World-Wide Reports of Landings of Unconventional Aerial Objects and their Alleged Occupants", boook by Charles Bowen, Neville Spearman publishers, U-K., 1969. [jv2] "En Quête des Humanoïdes" book by Charles Bowen, french translation of "The Humanoids", J'ai Lu publisher, France, page 54, 1974. [jv3] "Anatomy of a Phenomenon", book by Jacques Vallee, Tandem publishers, U-K., pp 129-130, 1974. [gl1] "Face Aux Extra-Terrestres", book by Charles Garreau and Raymond Lavier, Delarge publisher, France, page 123, 1975. [bb1] "La Grande Peur Martienne", book by Gerard Barthel and Jacques Brucker, Les Nouvelles Editions Rationalistes publishers, France, pp 109-110, page 199, 1979. [fr1] "OVNI - Premier Dossier Complet des Rencontres Rapprochées en France", book by Michel Figuet and Jean-Louis Ruchon, Alain Lefeuvre publisher, France, pp 160-161, 1979. [js1] "Le Dossier 1954 et l'Imposture Rationaliste", book by Jean Sider, Ramuel publisher, France, page 19, 1997. 0.1 Patrick Gross December 21, 2005 First published. 1.0 Patrick Gross April 8, 2009 Conversion from HTML to XHTML Strict. First formal version. Additions [fr1], [go1], [jb1], [lc1], [ud1]. 1.1 Patrick Gross April 24, 2009 Addition [bb1]. 1.2 Patrick Gross April 26, 2009 Addition [jv3], [js1], note "Sider versus B&B", explanation. 1.4 Patrick Gross June 6, 2010 Addition [le1]. 1.5 Patrick Gross June 29, 2010 Addition [jv5]. 1.6 Patrick Gross October 15, 2014 Addition [ni1]. 1.7 Patrick Gross January 10, 2017 Additions [pa1], [ub1]. This page was last updated on January 10, 2017.